My assigned blog was Flavour Mosaic, the blog is written By Michelle who describes her self as the occasional cooker, however looking through her blog she has some amazing recipes so I think she is definitely more than just an occasional cooker as she sounds very experienced in cooking. Like me Michele loves spices and she loves playing with spice mixtures in her recipes to me that's what I love too so I shall be dropping by Michele's blog often to try out more of her recipes. 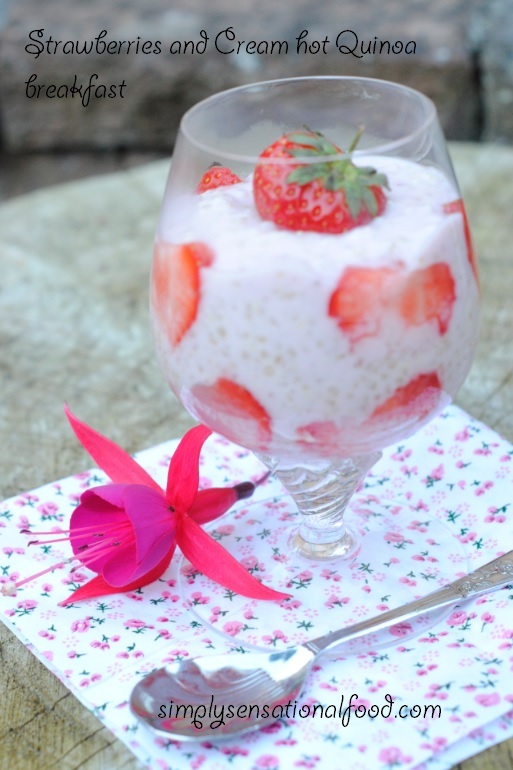 For the challenge I short listed many recipes but since I am trying to change our breakfast habits, I thought the strawberries and cream hot quinoa breakfast cereal would be the perfect recipe to prepare and present to my family. I followed the recipe and the only changes I made were that I used strawberry yoghurt instead of natural yoghurt and replaced the cinnamon with cardamom. Delicious and warm breakfast that's healthy and delectable too. 2. Wash and keep aside 2 strawberries for garnish and chop the remaining strawberries into slices. 3. In a bowl add the strawberry yoghurt, vanilla. nutmeg and cardamom and mix together. 4 To the yoghurt mixture add the cooked quinoa and mix together. 5. 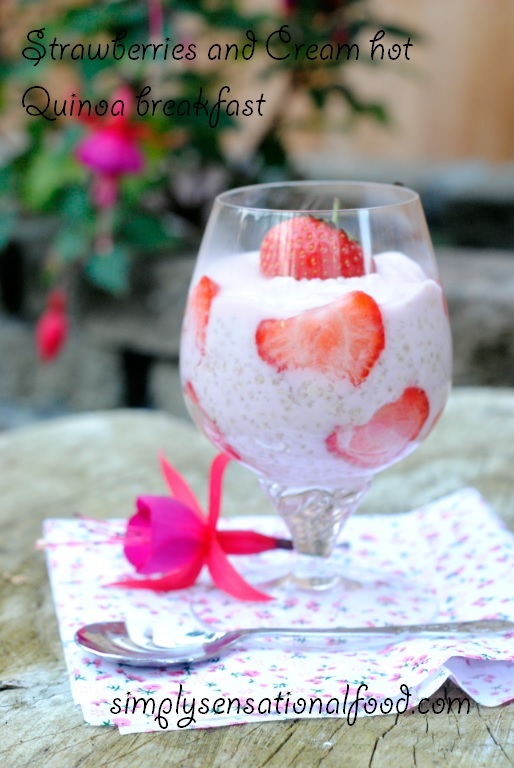 Get two serving glasses and spoon some of the creamy quinoa and yoghurt mixture. 6. Add a layer of strawberries and than add another layer of the quinoa and yoghurt mixture on top. 7. Finish off with a layer of strawberries. NB- You can also serve it as a chilled dessert. Nayna that is delicious. Imagination running riot.... yummy breakfast or dessert idea. What a great, and unique, way to use quinoa. I love the changes you made to the cardamom. What a great idea...and innovative use of quinoa:) Looks yum! This looks amazing - I love finding new ways to use fresh fruit at breakfast.